Normally after you cut your hand or break your elbow, occupational therapy may be required to regain full motion and function. So why not after breast cancer surgeries? Women (and men) who undergo mastectomies can develop shoulder pain on the same side of surgery. It is not uncommon to have issues even up to a year and a half or two years post procedure. In my many years of experience in the hospital, I have had an opportunity to work with patient’s right after surgery to teach how they may get dress and do their general activities of daily living while protecting their incisions. But I have also had the pleasure of working with these brave persons many months after mastectomies and even lumpectomies (though it is not as common). Shoulder pain can arise due to the nature of the positioning of the whole body pulled into a rounded forward should position over time. It can also be the pulling of the scar and the tight pecs muscles underneath. It is also largely due to the general weakness of the rotator cuff muscles and loss of rhythm between the long arm bone (humerus) and the shoulder blade (scapula). These several factors can cause an impingement which is when the two bones keep hitting into each other or can cause tendinitis when the tendons get inflamed due to the rubbing. Both cause pain but you may feel the type of pain differently. Overtime, the pain can limit your function and motion. 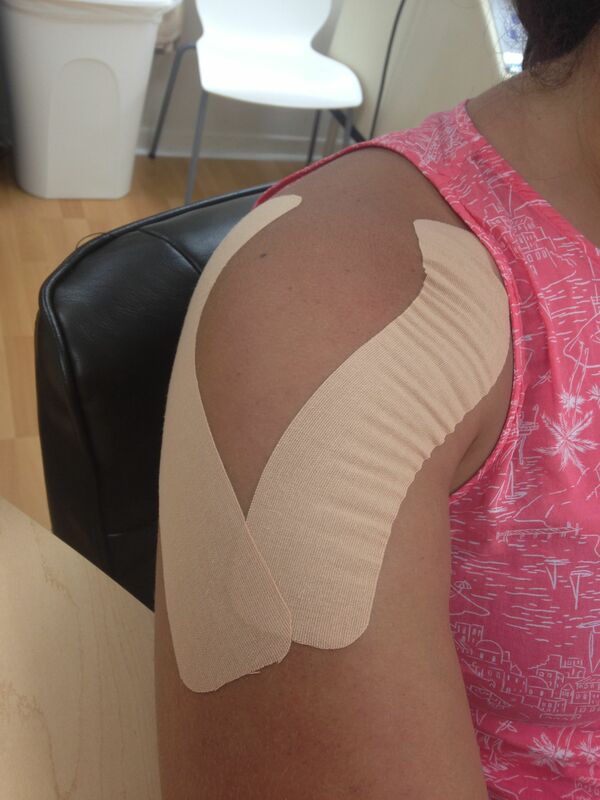 If you are not sure or are experiencing shoulder pain, you should consult with your doctor or therapist for help. It is rare for men to have breast cancer, but I have worked with at least 3 men who have had surgeries and a year or 2 years later present with shoulder pain. It is the same for woman, however unfortunately I have worked with many more. In the case of a recent surgery, scar massage and management is really important. The nature of scars to be tight and pull in. It is our job to fight that and pull out and over time the scar will soften. A good stretching program is very important to make sure you don’t have any end range tightness. If you stretch and you feel a certain tightness or pain, then it means that you need to continue to stretch. Pay attention to the pain though, there is “good” pain and there is “bad” pain. Stretching is the “good” kind of pain where you feel the pulling, may or may not be sharp but you can do it to your comfort, and it goes away as soon as you stop. Sometimes after a good stretch, your arm may feel tired. A “bad” kind of pain is when it’s very sharp and completely different then what you have been experiencing, and does not stop after you stop stretching. Your therapist can help you determine where you have the tightness, what stretches you need to focus on, and make sure you do them correctly! Of course, my biggest recommendation as that as the pain reduces, is to progress into a shoulder strengthening program. The rotator cuff is an important group of muscles to target and get stronger, but the muscles that surround the shoulder blade/upper back is also very important in the overall health of a good painful shoulder. Exercises do not need to be heavy but they need to be geared toward your needs and your precautions. For some with lymphedema issues, you may not be able to exercise too heavy. Others need to progress slowly. Your needs, your program. Make sure you speak to your doctor or therapist about your specific pains and limitations. But in the mean while, check out my video on youTube about stretching! It was in the last blog post but it’s so good for so many things! (at least I think so). Have a question? Not sure where you need to go, or who you need to speak with? Give us a call! I can help you! Breast cancer surgery side effects can greatly affect your quality of life. In most cases, the side effects are unavoidable and your surgeon will do everything possible to minimize them. But just because the side effects are unavoidable doesn’t mean they can’t be treated or eased. Absolutely! The decisions are a personal one. But if one has shoulder pain, therapy can help! Thank you for you comment! We just wanna say thnx to you for making this cool blog and keep going the good work! Thank you so much!! I hope it was helpful!